Stolin (Belarusian: Сто́лін; Ukrainian: Сто́лін; Russian: Сто́лин; Polish: Stolin; Yiddish/Hebrew: סטולין) is a town in the Stolin District in Brest Region of Belarus. It is the centre of the largest district in Brest Region. The population is 10,491 people (2012). The Belarusian-Ukrainian border is about 15 km (9 mi) away, so Stolin is now a border city that hosts many Ukrainians on market days. 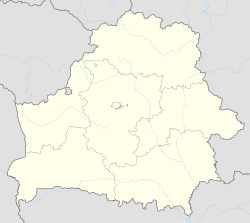 Russian speech is common here, but villagers prefer their dialects that are numerous and akin partly to the Belarusian language, partly the Ukrainian language. Stolin grew up at the heart of the Polesia region on the Haryn River, at the crossroads of two important routes, one leading northwards to Pinsk, two others eastwards to Davyd-Haradok and Turaŭ, that are now in Belarus, southwards to Sarny and Kiev, that are now in Ukraine. Archaeological evidence suggests that the area which Stolin now occupies, was settled as far back as the 12th century AD. The first mention of Stolin dates to 1555. There are three stories regarding the origins of the name "Stolin". The first refers to a group of local fisherman who cast their fishing nets into a lake a pulled out 100 fish or Sto [100 in Russian] "Leeni" [a type of local fish]. The second story refers to a ferry-boat which sunk in the river and required 100 men with 100 ropes to drag it out [100 lines in Russian]. The third refers to twelve brothers who ruled over seven nearby cities and chose what became Stolin as their meeting place and capital city, hence the name may be a derivation of stol (table)> Stolny Gorod (capital city). Stolin was occupied by the Germans from July 1941 to 1944. In August 1941, many Jewish refugees – especially women and children - from the nearby town of David-Gorodok came to Stolin. A ghetto was created in May 1942, surrounded by a barbed-wire fence. About 7,000 Jews lived in this small and unhealthy area, along the Bank River. The liquidation of the ghetto was conducted on September 11, 1942 by a squadron of German cavalry, the local police and the SD. The shooting took place near the airfield, in a large ditch. Wikimedia Commons has media related to Stolin. This page was last edited on 11 March 2018, at 18:27 (UTC).